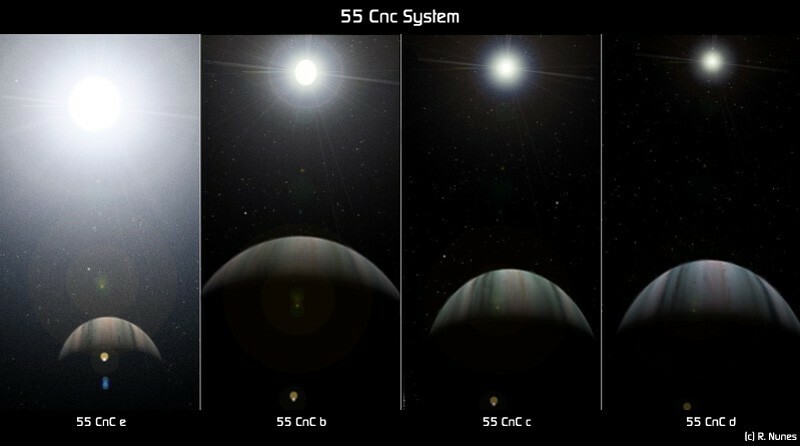 The 55 Cancri system is in some ways very similar to our own. The star is about the same mass and size as our Sun, and it has a Jupiter-sized planet at a distance of 5.7 AU, which is just slightly more distant than Jupiter’s 5.2 AU distance. It has three other gas planets, as well as a super-earth. One would think that the system might be similar in other ways, such as having rocky planets close to the star and gas planets more distant. But this is not the case. The Jupiter-type planet is actually the most distant known planet. It was first discovered by observing the motions of the closer planets, and noticing that their orbits drift slightly due to the outer planet. The three other gas planets are remarkably close to the star. One orbits at about the distance of Venus in our own system, while the other two are much closer than Mercury is in our own. The closest gas planet orbits the star every 15 days. It’s surprising that two gas giants would be so close to their star, as well as so close to each other. In fact, there has been some debate as to whether the planets could be stable over billions of years. But a recent article in the Monthly Notices of the Royal Astronomical Society shows they likely are. 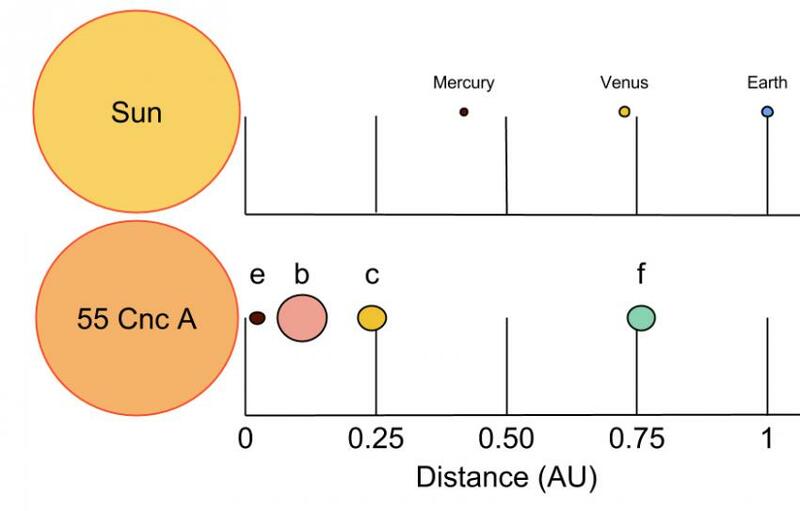 The paper compares detailed observations of the planetary motions with a statistical analysis of their orbital dynamics. 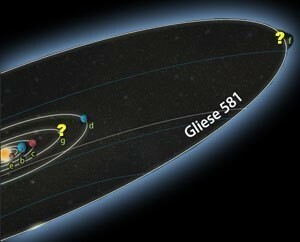 It was found that while the two gas giants do affect each other’s orbit in measurable ways, the pairing is stable over a long time range. So this planetary arrangement is not just a fluke of unstable orbits. What 55 Cancri shows is that planetary systems can vary widely and still be stable. Our solar system with rocky inner planets and gas giant outer planets is just one possibility among many.